Medical school is one of the hardest areas to get into and many applicants are disappointed every year. You will be competing against many others and often their qualifications will be as excellent as your own. Your only way to stand out from the crowd will often only be through a well written personal statement. Your personal statement format for medical school and your writing must be capable of getting the full attention of the admissions committee if you want any chance of getting selected for a place. 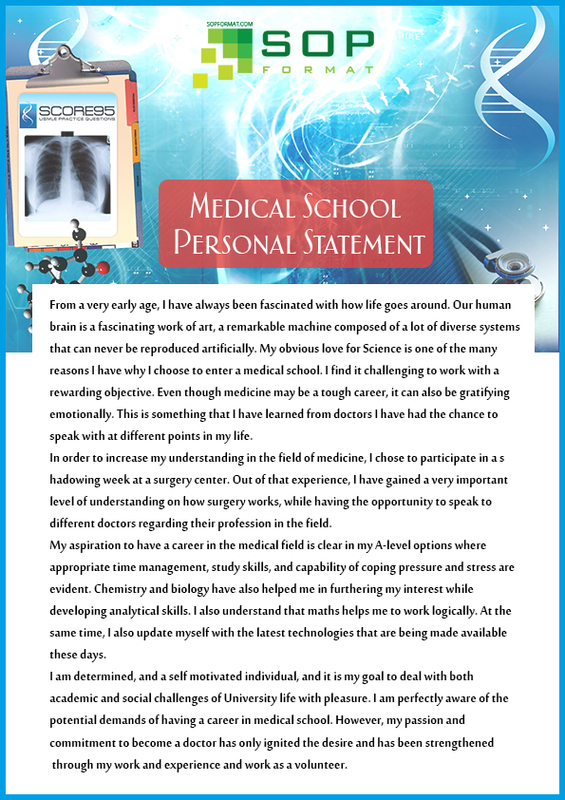 Personal statement format medical school and sop format for MBA provided by our team is definitely helpful in many ways for all. Understand well the exact idea of this format in order to write your own statement flawless and quality rich. What Is the Right Personal Statement Format for Medical School? Check the specific requirements for your personal statement for medical school format: if it is specified then make sure that you follow their requirements fully. Use only easy to use fonts that are a minimum of 12pt size. Do not mix fonts or try to use any scripts or other fancy lettering. Make your statement look clean by using wide margins of at least 1 inch on all four sides of the page. Avoid all use of color or decoration: you statement should be black ink on white paper only. Do not use all CAPS within your writing and avoid using excessive amounts of bolding or italics. Your writing should speak for itself. Review the expectations of the program that you are applying to with regards to the medical school PS format and any prompts that you must answer. Look at what they expect in a good applicant: review their website and other program information to make a prioritized list of what they look for in an applicant. Match your own skills and other attributes to this list to highlight the things that you should be highlighting within your writing. Create an outline for your writing using this information so that you can guide your statement writing and cover all of the areas that must be covered. Check the statement with great care: you must ensure that the writing reads perfectly and contains no issues at all. Review medical school PS examples: these can help you to understand the style of writing required as well as the areas that you should be covering. Do not however simply copy our medical school personal statement sample as that would be plagiarism. Find a good anecdote to build your statement around: you want to tell a story not make a list. A relevant anecdote provides you with the storyline and flow required to maintain the interest of the readers. Work on your opening: you have to be able to get the readers full attention right from the start. Something generic and boring will simply blend into all of the other statements, you must wake them right up right from your first words. Avoid all clichés: the reader wants to see something unique from you so you must not ever use anything that would be seen in any way clichéd. Write about yourself: your personal statement is about you not about someone else. Be concise: your writing should get straight to the point. Use no more words than you need to within your writing. Give examples: do not simply make claims, demonstrate clearly what you are capable of through concise examples to show what you can do. Do not simply repeat what is in your resume: your statement must be a unique part of your application that will sell you. Never lie: exaggeration and blatant lies are easier to spot than most expect and are not going to help you to get the place that you want. For more inspiration see the information about sample personal statements. Check our sample format today and use it well. Introduction: Admission officers always a pay utmost attention towards the introductory paragraph of the statement in order to evaluate well the student’s suitability for the program. It is always wise to introduce yourself to the medical school admission officer with positive and negative qualities as a blend in it. You will gain more trust through mentioning positive and negatives in it. You can follow the regular style of writing for this introduction, but make it sure to present well your interests, family background and some more. Never turn this paragraph into too lengthy as officer would be interested in evaluating you further through total essay summary, experiences, qualifications , childhood focus moment and some more. Body of SOP: Create this body with multiple paragraphs those are with enticing content quality and details about past education, experiences, acquired skills and some more. Never restrict your experiences and past working details up to a level of responsibility and try to expand it to further more extent in a detailed manner. Experiences with detailed approach presented in the SOP will gain more trust from the admission officer. Especially, when it comes medical field, never restrict your responsibility as a patient care associate and mention in detail the kind of duties performed by you in that position. Add these accomplishments along with future goal of your in it. Also, try to mention in detail, how you planned to accomplish this goal with the successful completion of the chosen program too. Always try to be more elaborate about your qualifications, subjects competency, skill acquired through experience and some more. Conclusion: It is definitely a not a final paragraph in your statement and it is definitely an important integral part of the statement too. Mentioned introduction and body parts are never be able to complete or satiate your statement for the admission. Try to write in it with detailed perspective yet keeping it brief on certain points such as goal, learning passion, acknowledgements, and some more. All these additions will turn your conclusion paragraph as a great addition for the SOP. If you have despaired to find the right service for you with the best quality/price ratio, be sure to check this post on pharmaceutical SOP writing help. Use our professional and highly effective tips to ensure that your writing and personal statement format for medical school is outstanding.